A witness whose legal statement is contained in an affidavit or sworn deposition: "An affiant is someone who makes a declaration in writing which is made with an oath before someone who is authorized to administer oaths; especially, for use as evidence in a court of law." "James was an affiant who gave testimony to the police about the driver of the car that ran into the back of another car and he swore to what he said to an officer of the court and signed the statement." A solemn and mutual promise of fidelity (loyalty to a person, a principle, or an organization): "Jeremy's affidation was that he would complete the project by a certain date." 1. In good faith, with sincerity; genuinely. 2. Acting or done in good faith; sincere, genuine. 3. In plural form, credentials authenticating someone's true identity, background, intentions, and good faith: Henry was a journalist whose bona fides could not be determined. Genuine or sincere; sincerity. The first expression is used to modify some other word, as in bona fide intentions; the second is generally used as the subject or object of a verb, as in "His bona fides is above reproach", and "We do not question her bona fides." Bona fides is a singular noun. Bona fide has been used as an adjective phrase in English so often that we all know its pronunciation as, BOH nuh fighd; however, its preferred Latin pronunciation is BAW nuh FIGH duh. To produce bona fides (BOH nuh FIGH deez), a corrupted Anglicized form, means to show good intentions in dealing with others, show credentials, prove one's identity or ability, etc. and so to indicate that no fraud or deceit is intended or shown. A bona fide agreement is one that is made in "good faith" which is a Latin phrase taken over bodily from the Latin bona, "good" + fides, "faith". A female friend to whom a person can trust to share secrets and not to share them with anyone else: "The manager's secretary was his closest confidante." 1. To have faith or trust and to be assured of secrecy. 2. To entrust (an object of care, a task, etc.) to a person, with reliance on his or her trust or competence. 3. To reveal, impart, divulge, and confess, usually secrets or inside information passed on to someone who can be trusted not to tell another person. 1. The mental attitude of trusting in or relying on a person or thing; firm trust, reliance, faith. 2. Feeling sure or certain of a fact or issue; assurance, certitude; assured expectation. 3. Assurance, boldness, fearlessness, arising from reliance (on oneself, on circumstances, on divine support, etc.). 4. The confiding of private or secret matters to another; the relation of intimacy or trust between persons so confiding; confidential intimacy. 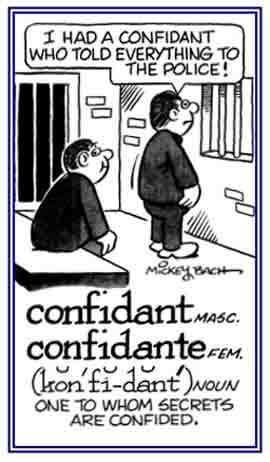 Confidence is the feeling that you have just before you fully understand the situation. Belief in yourself is a fine thing, but you should see to it that you are not too easily convinced; because confidence is that quiet, absolutely assured feeling you have just before you fall flat on your rear end. Showing page 1 out of 5 pages of 75 main-word entries or main-word-entry groups.